Now in a fourth edition, this bestselling introductory textbook remains the cornerstone volume for the study of second language acquisition (SLA). Its chapters have been fully updated, and reorganized where appropriate, to provide a comprehensive yet accessible overview of the field and its related disciplines. To reflect current developments, new sections on using learner corpora, semantics and morphosyntax (within formal approaches to SLA), sociocultural approaches, gesture, priming research, and chaos theory have been added. Students will also find expanded discussions of heritage language learning, bilingualism, pragmatics, and much more. The redesigned fourth edition of Second Language Acquisition retains the features that students found useful in the current edition but also provides new pedagogical tools that encourage students to reflect upon the experiences of second language learners. As with previous editions, discussion questions and problems at the end of each chapter help students apply their knowledge, and a glossary defines and reinforces must-know terminology. 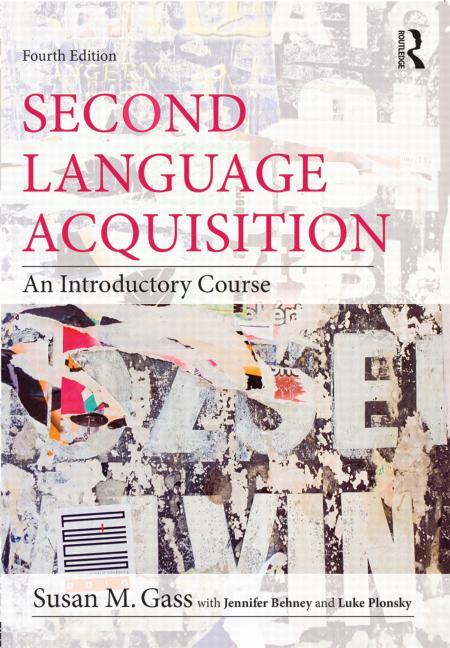 This clearly-written, comprehensive, and current textbook, by expert Sue Gass, is the ideal textbook for the introductory SLA course in second language studies, applied linguistics, linguistics, TESOL, and language education programs. Susan M. Gass is University Distinguished Professor in the Department of Linguistics and Germanic, Slavic, Asian and African Languages at Michigan State University. Jennifer Behney is Assistant Professor of Second Language Acquisition and Italian at Youngstown State University. Luke Plonsky is Assistant Professor of Applied Linguistics at Northern Arizona University.